Richard Levy and Ron Weingartner, who’s Toy Fair presentation I recently covered, are also the authors of The Toy and Game Inventor’s Handbook. Originally published 10 years ago, the book is highly regarded for providing valuable, practical advice on how to be successful in the toy and game industry. The pair have just recently published an updated version of the book, this time electronically in Kindle format. The Toy and Game Inventor’s Handbook, 2nd Edition, includes profiles and advice from over 80 industry professionals, revised licensing templates based on interviews with attorneys and agents, and a new “websitary” of valuable internet resources. For some reason, the toy and game business seems to attract a lot inventors who have big dreams but little to no previous industry experience. Why do you think that is? [Richard] Historically toy and game inventors do not come from the industry. Among the independent inventors interviewed for or discussed in our Handbook are, among many professions, a former barber, stock brokers, newspaper editors, a registered nurse, talent agents, artists, data systems programmers, psychologists, marketing MBAs, social workers, TV producers, a biologist and two former members of the clergy; a priest and a nun. People are drawn to the industry, we feel, because it has an insatiable appetite for new product and there is always the dream of creating the next Monopoly or Cabbage Patch Kids. For those people who have a dream but no idea what they’re getting in to, how would you describe the toy and game industry? What should they be prepared for? [Richard] Although the toy industry is lucrative for some inventors, most inventors have many more scars than medals. Toy development remains a filtering process. Items are in one day and out the next. New concepts are constantly flowing into review, and with thousands of proposals each year – not to mention internally generated products from R&D and Marketing – manufacturer priorities change and products are dropped, often in spite of substantial corporate financial commitments. To say the business is cut-throat is a bit harsh. We’d prefer to say highly competitive. It is a big market, $21 plus billion. A toy marketer wants to be first to show something unique to trade buyers and cash-in on consumer demand for the latest hot plaything. A winning product is not faceless. Consumers ask for it by name. The company marketing the product may be not well known. The inventor may be faceless since most toil in anonymity and seldom get recognized on packages and in the press. Thank you for including Purple Pawn in the book’s new directory of online resources—the websitary as you’re calling it. However, I doubt that adding us was why you produced this second edition. What are the big changes in the toy and game business that prompted you to update the Handbook? [Ronald] Our original publication of The Toy and Game Inventor’s Handbook was copyrighted in 2003. Obviously much has changed in the industry in the past decade. The changes are not only in product but in distribution with more e-commerce, social media marketing, and digital product infusion into toys and games, minimally addressed in our first edition. Inventors must be aware of these aforementioned factors as they attempt to interest marketers in new concepts. The “websitary” and hot links that appear throughout the second edition are efforts to provide information that should enter inventors’ perceptions of were concepts fit within the current industry. If you would, give our readers a little taste of what they can find in the book. What is a common mistake made early on by inventors? Is there something right now you would advise new inventors—in addition to buying your book, of course—something to help them avoid pain later on? [Ronald] We are believers that in the toy business where product is king, inventors are the kingmakers. Our basic message shines a light on what independent inventors contribute to the industry in filling the new product pipeline year after year. We want readers to understand how and what inventors have contributed through a bit of recognition and history of past playthings; the ordinary and the mega-hits, the process and obstacles ideas move through to get to market, and the impact entertainment licensing, technology, and consumer interests affect inventor efforts. 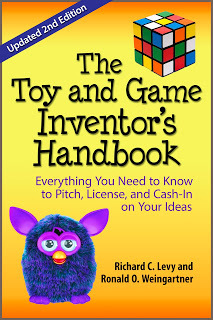 For new inventors, The Toy and Game Inventor’s Handbook (2nd edition) is designed as a self-help guide to creating, presenting, and licensing products to toy marketers. Guidance is provided by the inspiring words and non-theoretical advice from eighty professional inventors. Toy invention has always been a challenging profession. With fewer licensees and a global competitive field, the industry is highly unlikely to become more embracing for the faint of heart. However, we believe reading and applying much of the seasoned advice found in The Toy and Game Inventor’s Handbook content to creative thinking may well limit and hopefully avoid pain later on.